The movement that produced Trump should have surprised no one: It began amid the turbulence of the 1960s, when white southern Democrats began changing their party affiliation to Republican. 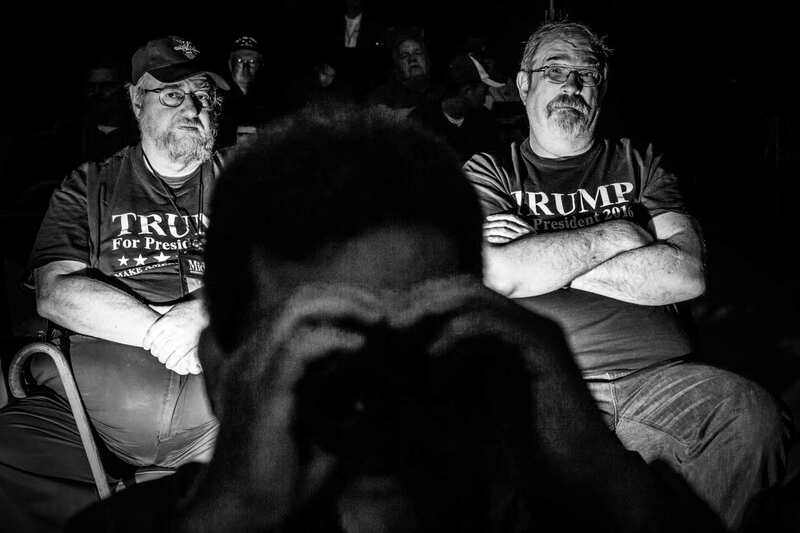 Over the next five decades, as the GOP built a three-legged stool of support from security hawks, social conservatives and fiscal conservatives, white working-class voters, especially men, gravitated toward the party but did not fit neatly into any of those groups. Over time, those voters felt little loyalty to a party that increasingly counted on their support in election years but otherwise paid them little attention. The Republican Party’s historic focus on supply-side economics — cutting taxes for the highest earners as a way to unleash economic growth and create jobs — has helped fuel the perception of the GOP as the party of the wealthy. 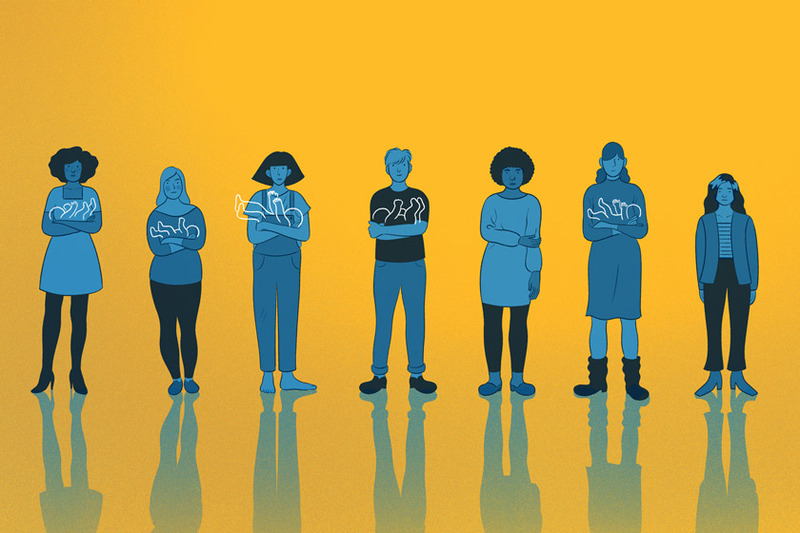 The Democratic Party, once the political home for laborers and unions, has evolved into a more urban, coastal and college-educated coalition, embracing a new base of women voters and the nation’s growing minority population. Working-class voters, particularly men, have felt increasingly marginalized, with no natural home in either party. 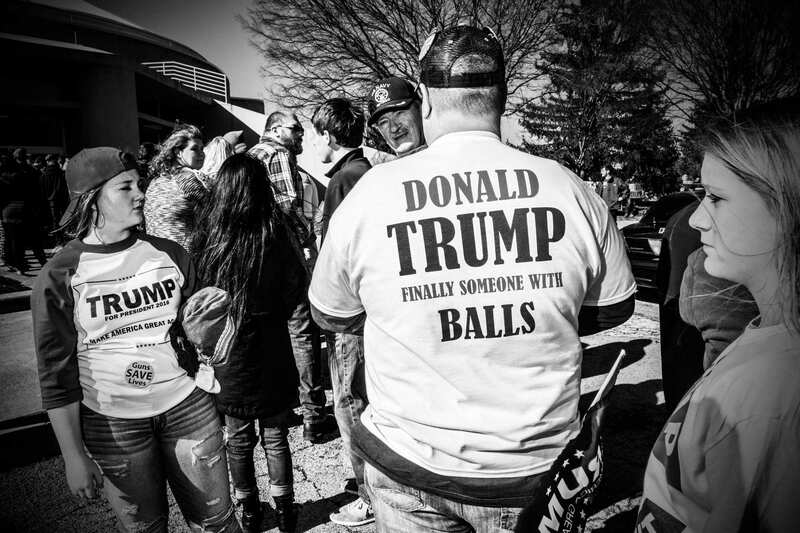 Trump’s political success was born of his willingness to speak unabashedly to those voters. 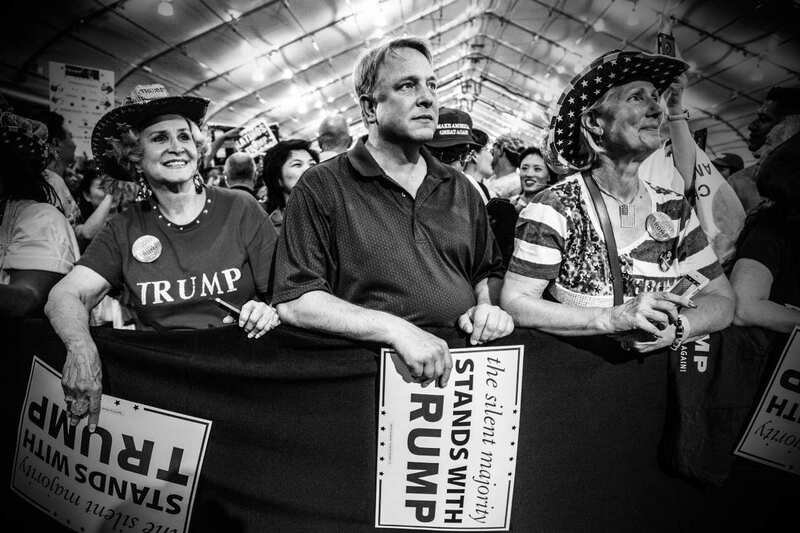 NBC News spoke with more than a dozen Republican thinkers, strategists and analysts, and reviewed data, polls and economic indicators to understand the history that led to the rise of Trump. For the GOP to become the party of Trump, it first had to become the party of Ronald Reagan. After the party’s standard-bearer, Arizona Sen. Barry Goldwater, lost his challenge to President Lyndon B. Johnson in 1964 by the largest popular vote margin in history, the making of the modern day Republican Party was in place. Crippled in the short term, the GOP ultimately adopted Goldwater’s focus on smaller government, strong national security and states’ rights. 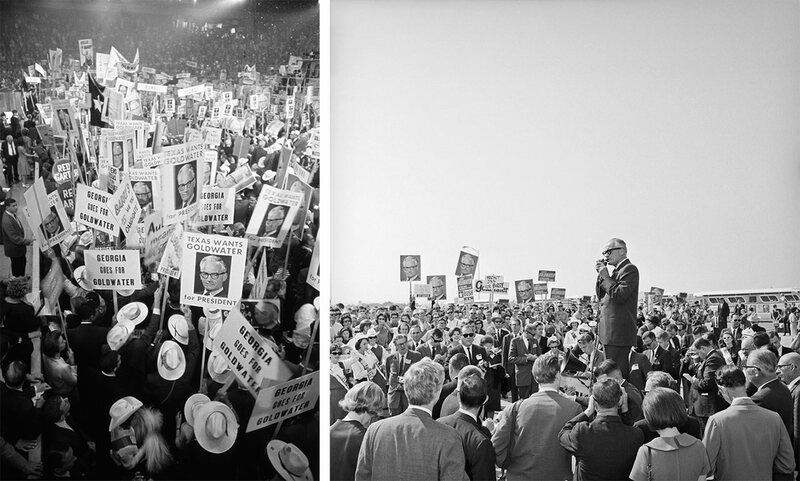 Barry Goldwater’s loss paved the way for the modern day Republican Party. More importantly, the landmark 1964 Civil Rights Act, and Goldwater’s opposition to it, signaled that the Republican Party would be a home for white voters — especially southern Democrats — unnerved by the burgeoning civil rights movement. 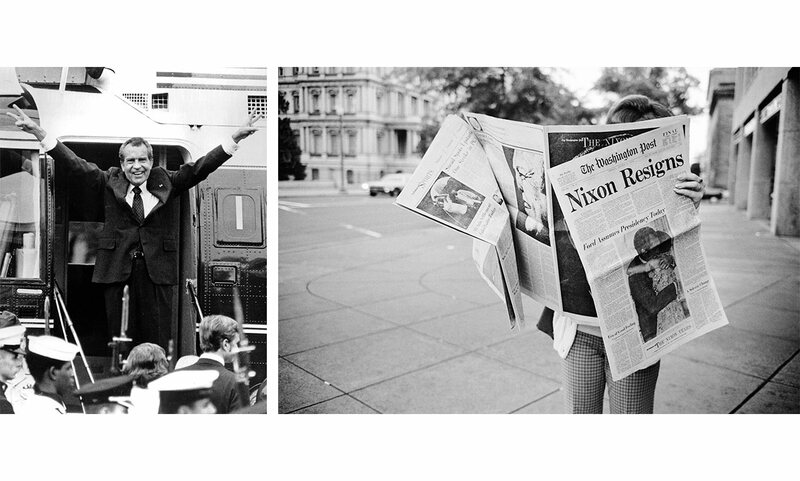 The GOP managed to elect President Richard Nixon in 1968 by a narrow margin, only to see its fortunes crippled anew after the Watergate scandal forced Nixon to resign in 1974. Party morale hit an all-time low, with GOP supporters feeling disaffected and only 21 percent of voters identifying as Republican, according to Pew Research Center. It was the party’s the worst showing in 70 years. Into the void stepped Reagan, whose surprise primary challenge to Republican President Gerald Ford in 1976 laid the groundwork for a staunchly conservative coalition built on a small government, a free market and religious values — a coalition that would all but expel the party’s more moderate, East Coast adherents. To be sure, the 1976 Ford-Reagan showdown initially deepened the party’s wounds. The primary battle continued all the way to the Republican nominating convention, the last time a major party nominee was decided there. Reagan narrowly lost to Ford that year but had become the Republican heir apparent. His brand of conservatism was on the ascent. Many factors led to the rise of Reaganism, including the candidate’s optimistic outlook, celebrity status and tough stance on national security. Economic and cultural factors played a major role as well: In 1976, with Ford in the White House, unemployment hit 9 percent. The post-World War II economic boom had finally slowed, with blue-collar workers facing a disproportionate effect. Simultaneously, the feminist movement had gained momentum, and along with the civil rights movement of a decade earlier, political attention was increasingly focused on minorities and women. 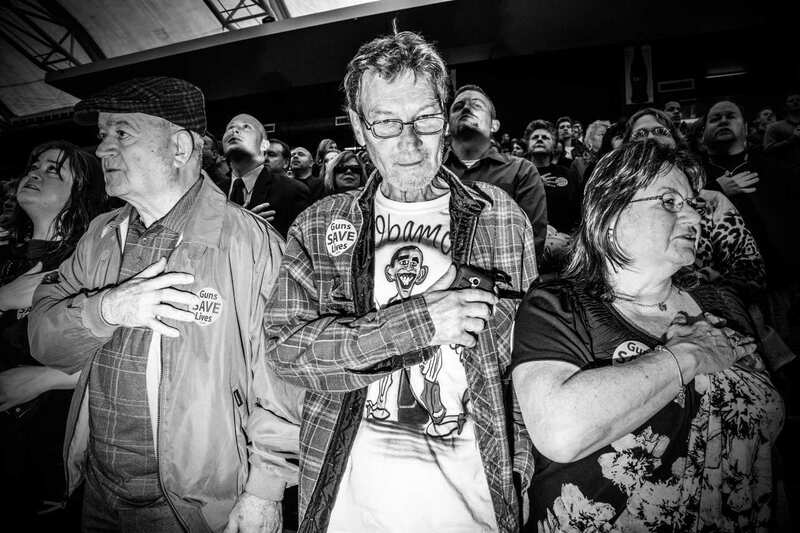 That left traditional white, working-class Democrats, whose economic struggles had begun a decades-long decline, feeling out of place in the party. Reagan ousted Democratic President Jimmy Carter in 1980 by a wide margin, expanding on Goldwater’s ideas of fiscal constraint, international dominance and social conservatism. Facing another squeeze in their economic situation, working-class men, traditionally Democrats, frustrated by years of weak job growth and stagnant wages, flocked to Reagan. Some 68 percent of voters in that election said the country is doing “pretty badly” or “very badly,” compared to just 44 percent in the previous contest, according to polls taken at the time. 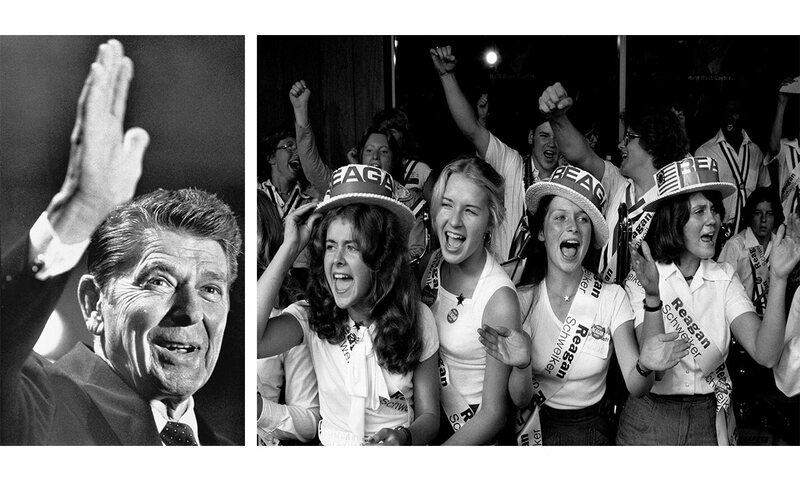 Men made up 55 percent of Reagan’s voters. He also won an easy majority of the 30 percent of voters whose household income was squarely in the working class or middle class: approximately $15,000 to $25,000 per year, roughly $64,000 to $104,000 in 2016 dollars. Reagan also won 27 percent of Democrats and 56 percent of people who identified as independents, according to exit polls, continuing and exacerbating the trend of white working-class Democrats migrating to the GOP. This new voting bloc, dubbed Reagan Democrats, fit the profile of those who make up the core of Trump’s support today. 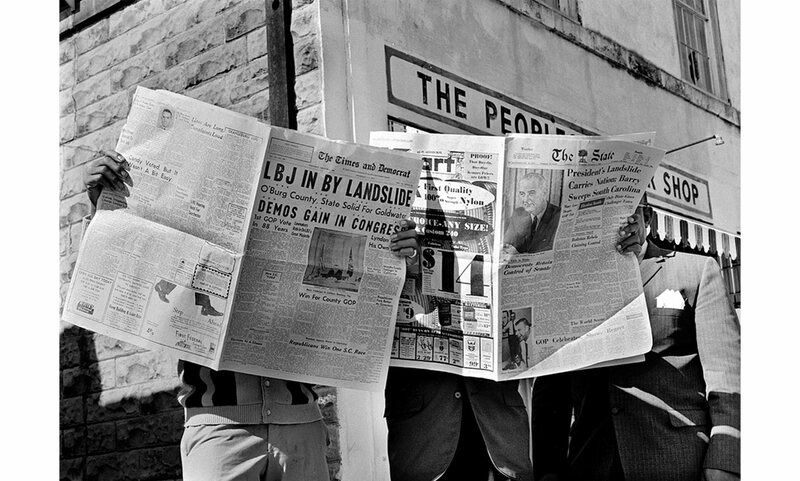 The 1980 election, Barbour argues, was where the working class, the middle class, the self-employed and the farm worker united to vote Republican for the first time. 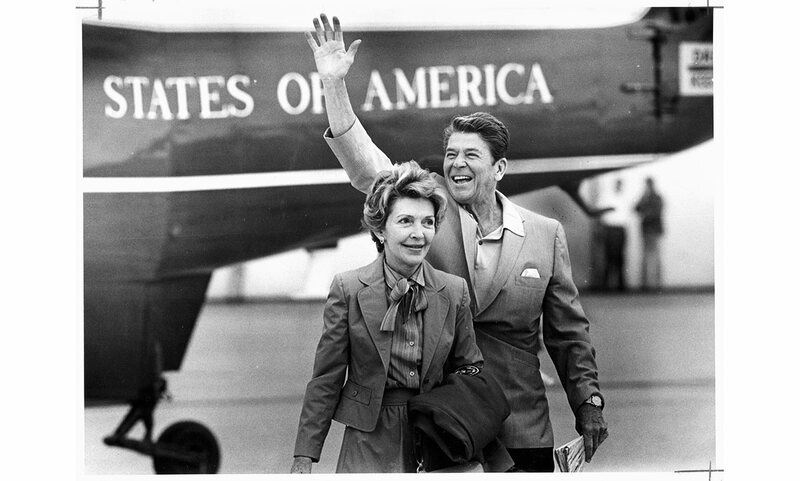 Reagan swept his re-election in 1984, winning 49 states. But as popular as he continued to be with blue-collar voters, he shepherded policies that helped to shape today’s global economy — policies Trump and his supporters now disparage. Reagan’s landmark 1986 tax reform plan gave the wealthy a huge tax break, reducing the tax rate from 70 percent to 28 percent for the highest income earners. 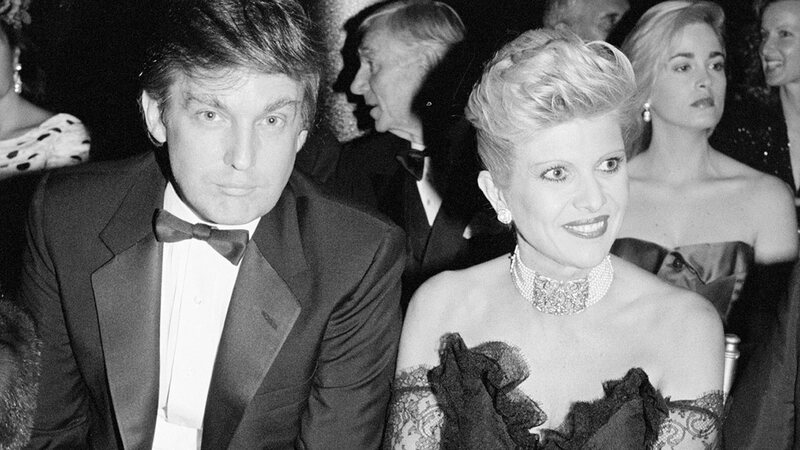 He also pushed free-trade policies, including the U.S.-Canada Free Trade Agreement, the precursor to NAFTA, the North American Free Trade Agreement, that Trump now rails against. Reagan also granted legal status to nearly 3 million undocumented immigrants living in the United States — a decision that would have significant political ramifications four decades later. More Trump Supporters Say Trade Deals Harm U.S. The economy eventually boomed under Reagan, but most of the gains went to the wealthy. A savings and loan crisis and the crash of the stock market near the end of his second term revealed that underlying economic conditions weren’t as strong as the era’s low unemployment rate suggested. The economic red flags weren’t immediately apparent during the Reagan years, and his popularity helped propel his vice president, George H.W. Bush, into the presidency in 1988. Seeking re-election four years later, Bush bore the blame for a sputtering economy, which had fallen into recession in 1990. Unemployment reached 7.5 percent in 1992, its highest level in 10 years. Many also turned to a renegade third-party candidate: Billionaire businessman Ross Perot, whose message of fiscal restraint and economic nationalism drew notice from voters of both parties. Perot’s burst of popularity caused a tremor in American politics: He won nearly 19 percent of the vote that year in the three-way contest. Perot’s message resonated with millions of voters who had flocked to Reagan and who closely resemble Trump’s early supporters today: They were white, concerned about the economy, not very religious and largely apolitical. Exit polls that year found 38 percent of Perot voters said they would have voted for Bush as a second choice, and 38 percent said they would have supported Bill Clinton. While Republicans lost the 1992 election, the party focused on the future — ultimately winning back most of Perot’s supporters. Barbour, who chaired the RNC in 1993, said his top priority at the time was to turn those voters Republican. He reached out to Perot’s key supporters nationally and in local communities, inviting them to help rebuild the GOP. It worked. By the 1994 midterm elections, Barbour estimated that 80 percent of Perot supporters voted Republican — helping the party take control of both the House and Senate for the first time in decades. 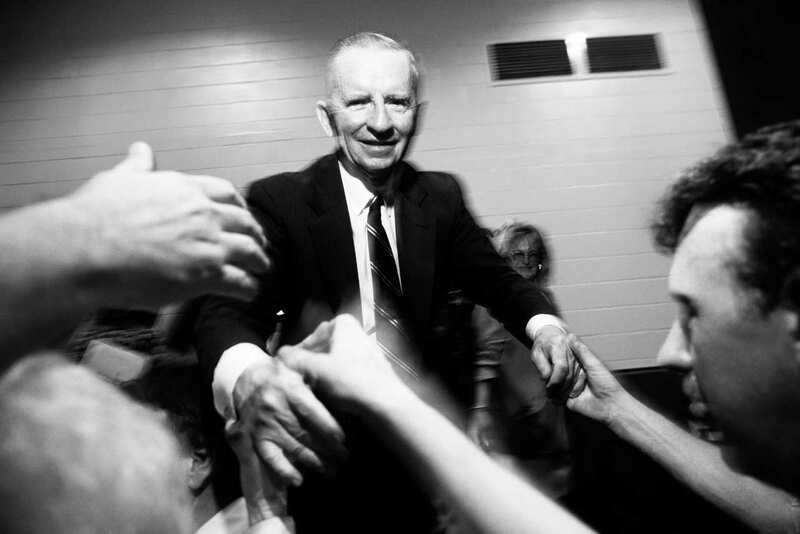 Wooing Perot’s voters was only part of the GOP comeback story that year. President Clinton made a series of policy decisions early in his first term that alienated many working-class voters, such as championing a ban on assault rifles and signing NAFTA at a time when U.S. manufacturing was in steep decline. Some 25 percent of manufacturing jobs were lost between 1980 and 2005, according to an analysis by the Brookings Institution. White men, especially those without a high school diploma, saw a 13 percent decrease in wages between 1990 and 2013, the Hamilton Project found. 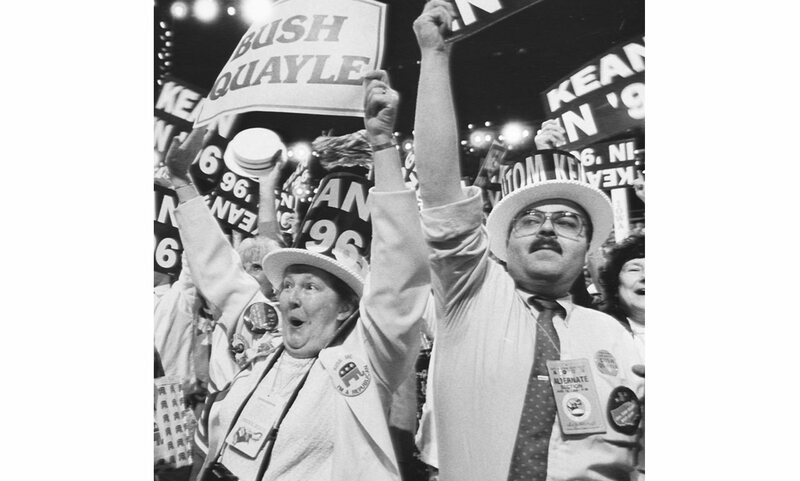 During the mid- to late-1990s, the Republican Party continued its transformation as a largely regional party of white, socially conservative religious voters. Those concerned more about pocketbook issues — the former Perot voters — remained in the GOP camp but still had little loyalty to the party itself. They did side with Republican George W. Bush in the 2000 presidential contest, where Bush prevailed over Democrat Al Gore in an election so tight it was decided by the Supreme Court. 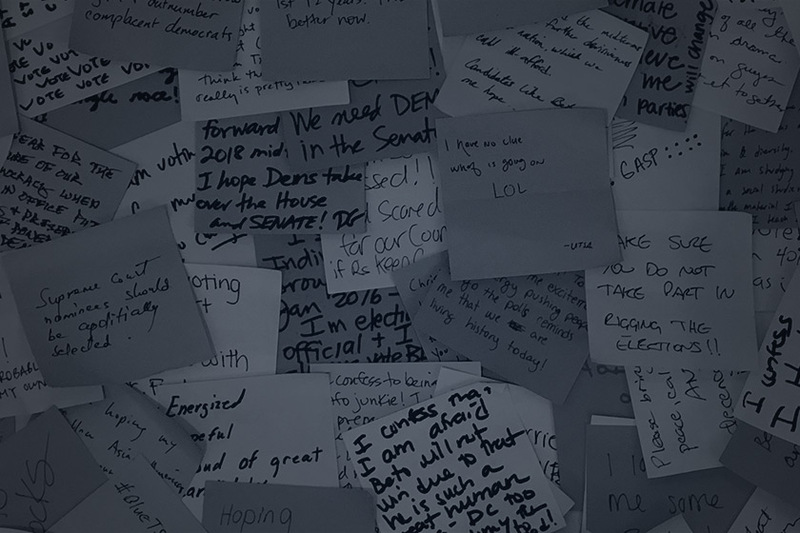 Despite the narrow loss that year, Democrats began seeing the benefits of years of targeted outreach to minority and female voters. Exit polls in 2000 found Democrats cementing a coalition of African-Americans, Hispanics and women that would be key to the party’s later success. 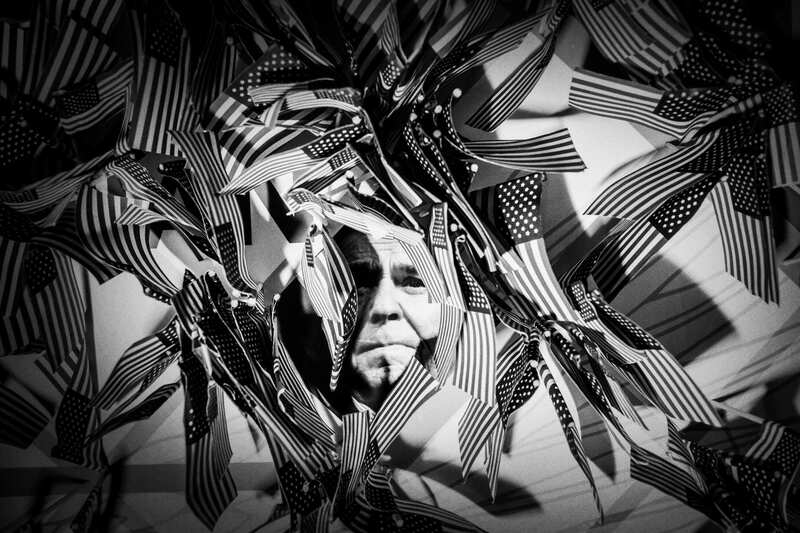 It was during Bush’s two terms in the White House, from 2001 to early 2009, that tensions between Washington Republicans and the party’s white-working class base began to spill out in the open. Bush’s tax cuts of 2001 put more money in the pockets of working Americans, but it was the wealthy who benefited the most, especially as a result of a major decrease in the capital gains and dividends rate for investors. The top 20 percent of American earners enjoyed 73 percent of the tax breaks, according to the Washington Post, exacerbating the notion that that Republican Party fought for the wealthy and leaving working-class voters feeling ignored. Immigration reform, an issue that had been percolating for years, re-emerged during Bush’s years in a battle that would leave deep scars and ultimately accelerate Trump’s rise. After Reagan’s 1986 amnesty effort and during the 1990s economic boom, undocumented workers poured over the southern border. Some 11.6 million undocumented immigrants were living in the United States by 2006, according to a Department of Homeland Security estimate. The country’s nonwhite population continued to grow amid projections that the U.S. was speeding toward a day when minorities would become a majority. In 2005, Texas became the fourth state with more nonwhite residents than white, following California, Hawaii and New Mexico. The nation’s economy began to slow again toward the end of 2005, with blue-collar workers again among the hardest hit. That slowdown triggered a wave of tension and fear directed at undocumented immigrants, who were blamed for depressing wages and draining services like health care and education. More Trump Supporters Feel Immigrants Are a Burden on U.S.
Seemingly unaware of the anti-immigrant anger bubbling in the GOP base, Congress, encouraged by the Bush administration, worked to pass legislation that would enable undocumented immigrants to obtain work authorization and legalization. Republican leaders defended the effort, insisting the party’s electoral future would be imperiled if it didn’t embrace Latinos — the fastest-growing segment of the U.S. population. Working-class white Americans, meanwhile, believing that immigration reform would harm their own chances for jobs and prosperity, pushed back. 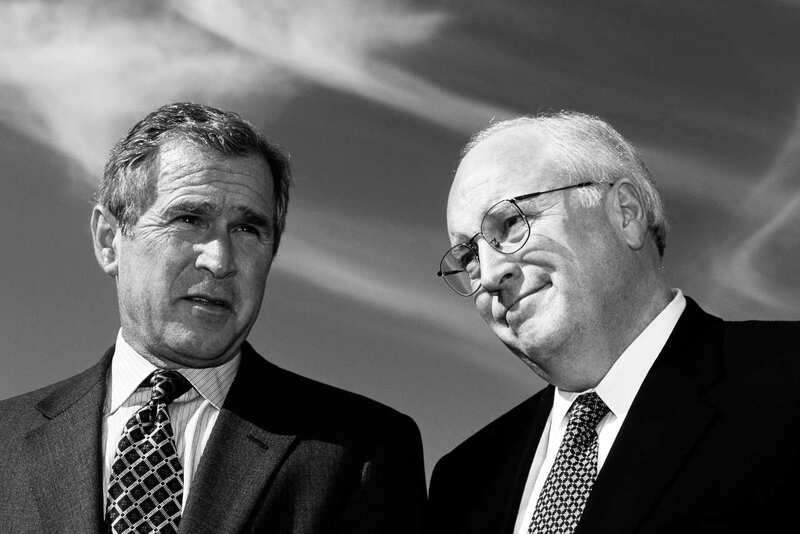 Other decisions during the Bush years alienated Republican voters, including an explosion in government spending led by costly wars in Iraq and Afghanistan and the largest expansion of Medicare since it was created in the 1960s. The final straw for the GOP base came in 2008, when the government’s response to the great recession and financial crisis caused an outright revolt. Too many voters did not believe that the system responded to them. Congress, at the request of the Bush administration, passed TARP, the Troubled Asset Relief Program, which was nearly $1 trillion to bail out Wall Street firms. The bailout came as people watched in horror as their homes were foreclosed, their retirement accounts depleted and their jobs eliminated in one of the fastest economic spirals in American history. Barack Obama’s election that year set off a new level of anger and recrimination among white working-class voters. The nation’s first black president had been swept into office by a newly empowered coalition of African-Americans, Hispanics, young people and women. White men lost. Badly. Obama won only 41 percent of white men in 2008 and just 35 percent of white men four years later. Obama’s 2008 win brought with it a filibuster-proof majority of Democrats in the Senate and a comfortable majority of Democrats in the House of Representatives. Democratic lawmakers, along with the new president, governed aggressively against a wall of Republican opposition. The faceoff over spending and government activism led to an explosion of populist anger and the eventual creation of the tea party. With almost no Republican support, Obama and congressional Democrats pushed through several high-cost measures aimed at rescuing the nation’s economy, including a $1 billion stimulus package, a bailout of the U.S. auto industry and the Affordable Care Act, which reshaped the health care system. The tea party, meanwhile, with the help of conservative media, placed immense pressure on Congress to change its ways. Republican lawmakers at first dismissed the movement, but once GOP incumbents began drawing tea party primary challengers, party leaders began listening. What Republican elected officials failed to recognize was that the anger directed at Washington wasn’t simply about the size and scope of the federal government as espoused by the tea party. Indeed, many white-working class voters weren’t being represented by tea party demands. They cared more about their stagnant pay check, their inability to find a job and their shrinking pensions or 401(k) accounts. While economic conditions had been in decline for nearly three decades for those voters, the Great Recession hit them especially hard. Men lost jobs at higher rates than women during that period, with male unemployment rising by 120 percent compared to 84 percent for women, according to the Urban Institute. Those with the least education suffered the most: While the unemployment rate for college graduates during the recession was just 5 percent, it was 11 percent for high school graduates and 15.6 percent for people without a high school diploma. Republican leaders missed it – or didn’t distinguish the difference. Deferential toward the tea party, GOP lawmakers allowed a government shutdown over Obama’s health care law, forced a freeze in government spending known as sequestration and demanded concessions in exchange for a lift in the debt ceiling. All those efforts fell short, causing public opinion of the GOP to sink further. It was an oversight that cost the GOP dearly, according to Henry Olsen, a senior fellow at the Ethics and Public Policy Center. 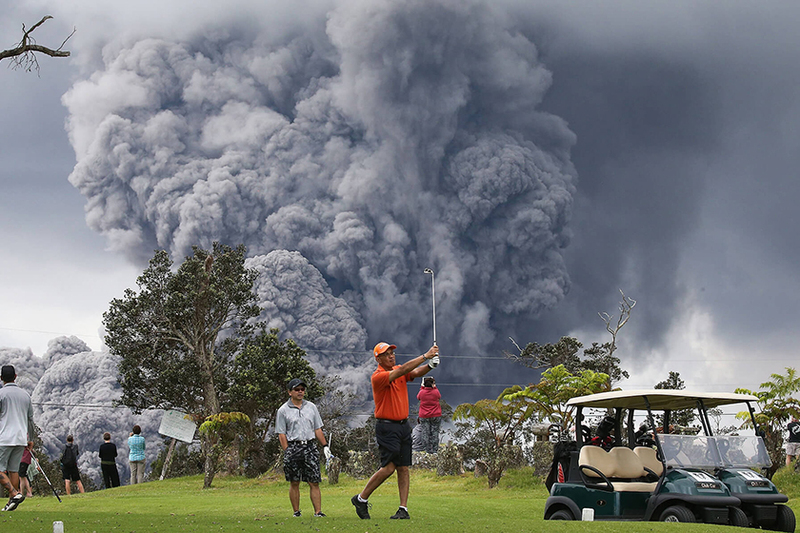 “Once you see that there’s two different earthquakes, it’s harder to put the party back together,” Olsen said. Piled on top was the Supreme Court’s 2010 Citizens United decision, which opened the floodgates of unlimited campaign contributions from corporations and wealthy Americans. Republican leaders moved quickly to capitalize on the decision, while working-class voters were left again to feel that they had no voice in the political system. By the time Republicans nominated former Massachusetts Gov. Mitt Romney to challenge Obama in 2012, it was clear that the Mormon multimillionaire, who embraced establishment GOP policy positions on tax cuts and small government, wasn’t the right fit for the party’s restive base. Romney represented the political status quo at a time when only 33 percent of Americans had a favorable view of the federal government, according to a Pew Research poll. The result represented the bottom of a steady decline from 64 percent favorability in 2002, after the Sept. 11 attacks. Romney made himself an even bigger target with secretly recorded comments suggesting 47 percent of Americans wouldn’t vote for him because they were in some way dependent on government benefits. Republicans knew the remarks had created a problem, but they misdiagnosed it: Plenty of GOP-leaning voters were part of the 47 percent, receiving and relying on government spending like unemployment benefits and Medicare. This was yet another miscue. Once again, Olsen argued, party leaders had failed to hear and address rank-and-file Republicans’ concerns. Those voters — Trump voters today — want Washington to care about people “like them,” Olsen said. Millions of people feel they were left behind. “They don’t want immigration reform, they don’t want expanded minority outreach - all things the Republican Party addressed in a 2012 autopsy after losing the election,” he said. 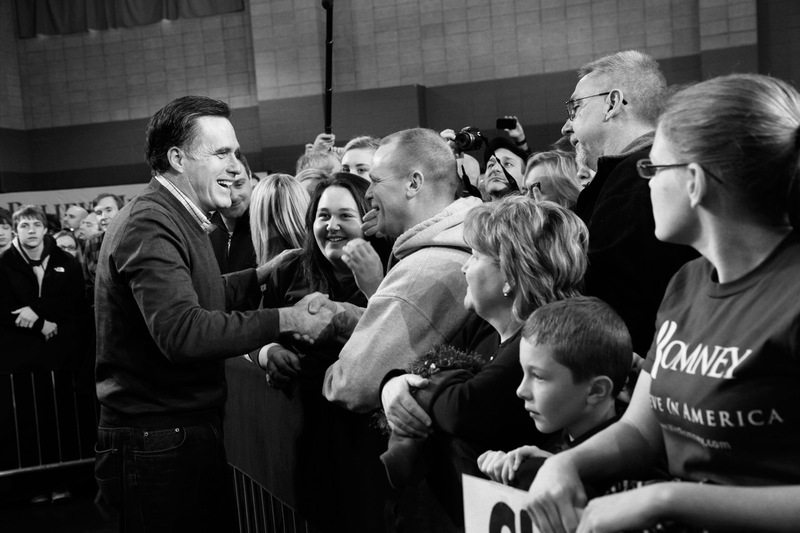 Exit polls in 2012 bore out the disconnect between Romney and the base: Just 18 percent of voters — fewer than one in five — thought he cared about people like them. “Millions of people feel they were left behind. A lot of these voters were historically Republican voters and looked to the Republican Party for answers and don’t feel like they found them,” strategist Haynes said. A Pew Research poll from December 2015 found that 62 percent of respondents thought the Republican Party represented the wealthy. Sixty-two percent also said the government doesn’t do enough to help the middle class, and 61 percent said the government helps the wealthy too much. Republicans have been working to address the compassion gap, attempting to shift perceptions of the GOP from a party of the wealthy to one that cares about the economically disadvantaged. The effort has been led by House Speaker Paul Ryan, who’s made the issue of poverty a key component of his conservative economic agenda. But an anti-poverty agenda missed the point. Trump supporters aren’t poor, they’re workers whose wages haven’t risen adequately; they own small businesses that are struggling instead of thriving; they have lost a job or have seen friends lose jobs too many times. They have witnessed decades of economic stress and their political leaders’ insufficient response. 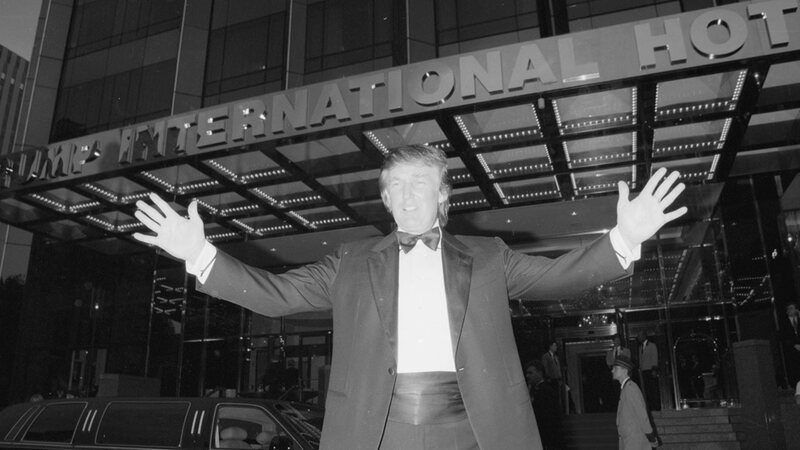 Enter Trump, who throughout the 2016 contest has shown an uncanny ability to intuit the struggles and concerns of people who have been searching for a champion for more than 40 years – voters who believe everyone is winning but them.